What Are the Benefits of Cranberry Seed Oil? Cranberries pack multiple disease-fighting properties and are well-known for their ability to prevent urinary tract infections (UTIs). However, according to the George Mateljan Foundation, cranberries also contain nutrients that act as antibiotics, combat the herpes virus, maintain gastrointestinal and oral health, prevent kidney stones and cancer and help to manage cholesterol. In addition, the Foundation reports that all you need to receive these nutritional benefits is to drink 4 to 8 oz. of cranberry juice a day. 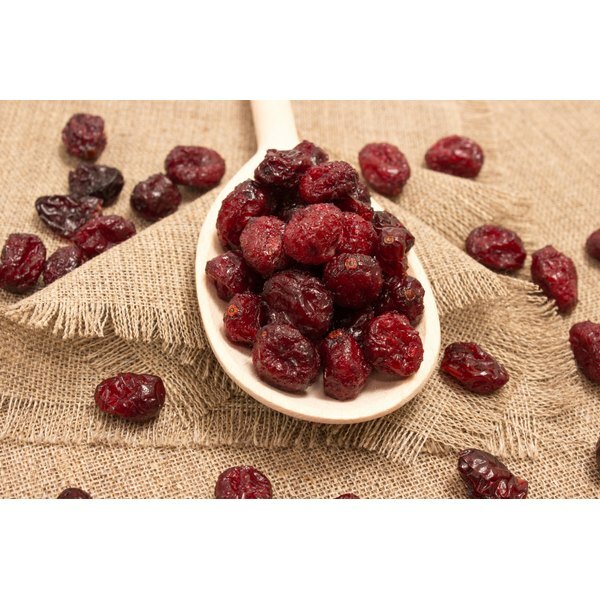 Cranberry has 438 Calories and 4.17 g of Protein per 100 gram serving according to the nutrition facts provided by the USDA Food Composition Database. According to The Cranberry Institute, the North American cranberry was used by Native Americans for food, in rituals and as medicine. The Institute states that Henry Hall, a Revolutionary war veteran, planted the first cranberry beds to be used commercially in 1816. As of 2003, the Institute reported that there were approximately 40,000 acres of cranberry farms in the United States and Canada. The George Mateljan Foundation reports that cranberries have high concentrations of vitamin C, dietary fiber, manganese and vitamin K. Vitamin C plays an important role in the growth and repair of tissues in your body and is one of the major vitamins that contain antioxidants, according to MedlinePlus. Fiber provides a full feeling and aids in digestion. Manganese, according to the George Mateljan Foundation, promotes bone, teeth and nerve health. Vitamin K is the vitamin that makes blood clot. Cranberry juice helps to prevent urinary tract infections by preventing E. coli, the bacteria that causes UTIs, to adhere to the mucosal surface of the urinary tract walls, states the George Mateljan Foundation. This ability to prevent the adherence of E. coli is thanks to the presence of an astringent called tannin that separates cranberries from other fruits that have similar active compounds, such as apples, and is why, reports the George Mateljan Foundation, experts from the Worcester Polytechnic Institute propose that cranberries can be used as an antibiotic to cure herpes, kidney infections, oral diseases and prevent cancer. In addition, because of the high vitamin C content of cranberries, the fruit is ranked as one of the highest in antioxidant activity which protects you against common colds and the flu. The George Mateljan Foundation recommends that you drink 4 to 8 oz. of cranberry juice a day to receive the full nutritional benefits of the fruit. Eating fresh cranberries will also give you the nutritional benefits, however, the harvest season for cranberries only lasts between September and December, according to The Cranberry Institute, making cranberry juice a more reliable source. If you chose to purchase fresh cranberries, the Centers for Disease Control and Prevention recommends that you look for cranberries that are shiny, plump and in the color range of bright light red to dark red. Also, the berries should be able to bounce. For cranberry juice, the George Mateljan Foundation recommends that you look for unsweetened cranberry concentrate that will be cheaper and healthier for you. Low-calorie versions of cranberry juice, reports the Foundation, are often sweetened with aspartame. Tracey Wallace began her writing career in 2007 as an op-ed columnist and literary reviewer. She has since gone on to write beauty and fashion advice for NaturallyCurly.com, ELLE.com, Time Out New York, Birchbox.com, YouBeauty.com and Shoptiques.com. She is passionate about women's rights and all of her work includes inspirational and empowering advice and tips for women to encourage them to follow their dreams and stay true to themselves. What Fruits Are High in Antioxidants?